Perfect Costume Topper for Men or Women! NOTE: This is a fitted hat. It is important that you take measurements and check the size chart before ordering, to avoid getting a hat that does not fit, and not having it to wear for your important event. Please don't rely on size tags from other garments or others you have purchased in the past. Measure head about 1" above the eyebrows, and above the ears for size. 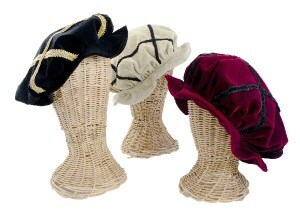 This striking period hat is made of rich cotton velvet and accented with contrasting braid trim. 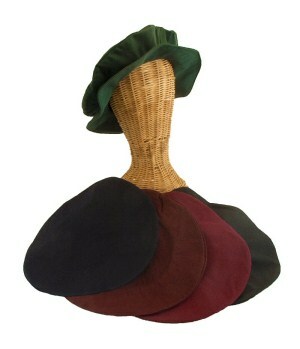 Choose hunter green with black braid, burgundy with black braid, or black with yellow braid. Sizes large and X-large.